Club talisman and third highest all time points’ scorer Callum Fowler is back with the Invicta Dynamos for 2016/17 and this term he will lead from the front after Head Coach Kevin Parrish appointed him captain for the new campaign. Despite still being just 24 going into 2016/17, Callum Fowler has a six year history of senior hockey with the Dynamos which began back in the summer of 2010. An 18 year old Fowler arrived from the EPL’s Peterborough Phantoms ahead of 2010/11 and he quickly went on to establish himself as one of the league’s most prolific and skilful players. 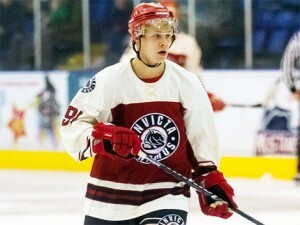 Five consecutive terms in Gillingham would follow during which the skater scooped the prohockeynews.com NIHL South Division 1 Player of the Year award as well as Player of the Year and Supporters Player of the Year honours at the club’s own presentation evenings. The accolades were recognition of his emphatic statistics – Fowler tallying a remarkable 181 goals and 287 assists for 468 points in just 193 appearances. Notching over 450 points in the NIHL South’s top tier was always going to draw attention from teams in the league above and the Bracknell Bees came calling ahead of 2015/16 prompting Callum Fowler to switch to Berkshire. However, despite making an impact with the Bees, the forward’s EPL stint was cut short as his new side suffered financial turmoil but Bracknell’s loss was the Dynamos gain as the skater headed back to Kent. 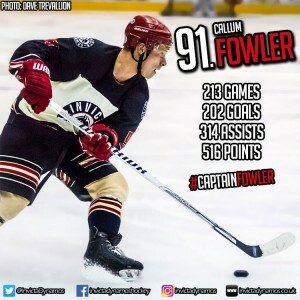 21 goals and 27 assists followed in 20 fixtures as Fowler helped push the Mos to a second place finish in the league as did a number of personal milestones – the club’s number 91 reaching his 500th point on home ice against Streatham in February and scoring his 200th goal versus Milton Keynes in April. Now he will be hoping to further add to his mammoth tally of 516 points in Invicta colours when he returns to the Dynamos as captain for 2016/17. Speaking on the re-signing of Callum Fowler, Head Coach Kevin Parrish said, “Callum is probably the most naturally gifted player in the division and I’m delighted he has extended his spell with the Dynamos to another season. 516 points in 213 games says all you need to know about what he brings to his side and Callum is a player capable of turning a tie at any moment with the unexpected. He brings a spark, a bit of flair to the ice but on top of that his determination and hunger add drive to the team. The Dynamos are Callum’s home club and after seeing him lead from the front for several years and having watched him mature significantly both on an and off the ice I think the time is right to give him the ‘C’. Callum will be our captain in 2016/17 and I think he will thrive with that added responsibility and show another dimension to his game. I look forward to working with him again and I’m sure the supporters will be equally pleased to have him back on the roster”. 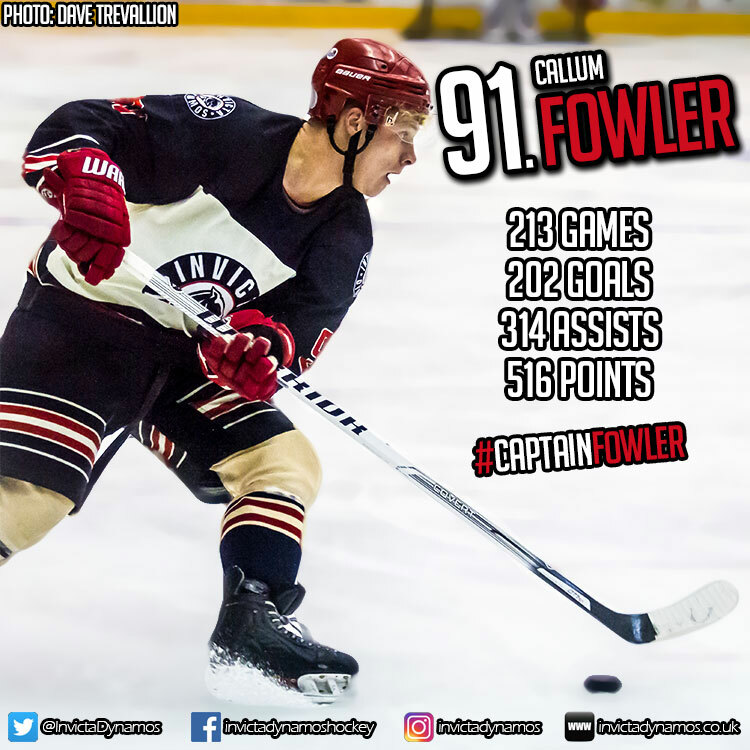 Callum Fowler has made the number 91 jersey his own in Kent and the new club captain will continue to don his favoured digits come 2016/17. His signing takes the roster to 13 players with further player news to follow soon. Warm-up Jersey – For just £125 get your name or logo printed on the back of Callum Fowler’s warm-up jersey. Sponsors are then presented with the jersey to keep at the end of the season. Game jerseys – Get your name or logo on the back of Callum Fowler’s game jerseys and become a part of the action.